. Amulets for SHUSSE . A glass wind chime for SHUSSE ! to pray for a good career is very important for many people in Japan. There are various temples and shrines where you can do that. Here I will introduce some of them. Hideyoshi prayed here for his career, so this is a famous spot. In 1587, when Hideyoshi became regent of Japan, he had many shrines for Inari, the Fox Deity, erected in the country. Even the Tenno visited this particular Inari shrine and gave it the special name of "Shusse". Aristocracy and Feudal Lords came to pray here later. There are more than 329 torii gates, given as presents from people who's wishes for sucess and a career in life came true. Here you can buy talismans for 10 different wishes in your life and career. 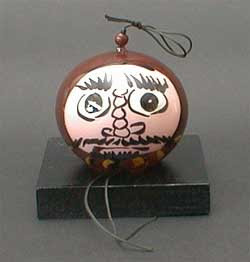 This clay bell looks almost like our Daruma ! Koma-jinja　高麗神社 Koma Shrine "Korea Shrine"
The enshrined deities are Koma no Koshiki Jakko, Sarutahiko no Mikoto and Takenouchi no Sukune (a legendary statesman). The shrine was founded in 716 by an emissary from Goguryeo, Koma no Koshiki Jakko, as the head shrine to guard the Koma district (present-day Hidaka City). 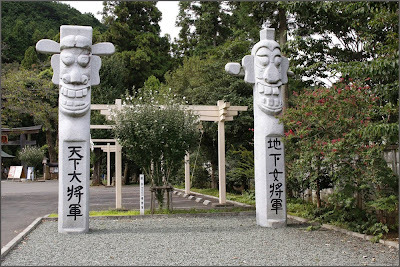 It was originally named Shirahige Myojin and is the headquarters of all the 55 Shirahige and Shirahige Myojin shrines in the Musashi province (present-day Saitama Prefecture), from which it is also called Koma Soja Shrine (the head shrine). In the precinct are a lot of cultural properties including the Old Koma Family Residence. Since the Meiji period, a lot of people, who had visited this shrine to offer a prayer, became powerful politicians including prime ministers, the shrine has been worshipped as Shusse Myojin 出世明神. Koma Shrine is also famous for cherry blossoms in spring and chrysanthemum flowers in fall.
. Koorai, Kŏrai 高麗 Korai, Koma - Korea .
. Matsuyama 小谷山医座寺 Iza-Ji . The statue was moved from 三十間堀 Sanjikkenbori to Mitsukoshi in 1968. Next to it is 三囲神社 Mimeguri Jinja. 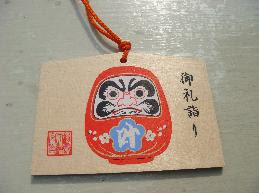 Jizo is venerated for making a good successfull career, and also for general good luck, prosperity in business and a long life. 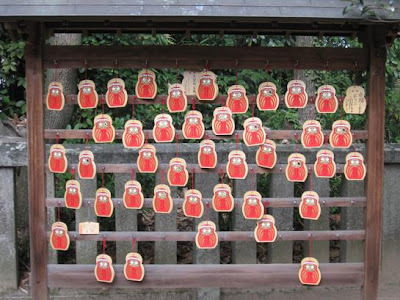 People come especially on the auspicious days for Jizo, on the 7th, 18th and 29th of each month. At that time there were special roadside shops 銀座八丁 but all was lost during WWII.
. Pilgrimage to 10 Shrines and Temples in the Ginza .
. shusse uo, shusseuo 出世魚 career fish . Well, as they grow up they change their name, and some say, the flavor when used in food, they have noticeably distinct flavor profiles as they mature. ..... In Japan, there are kinds of fish called shusseuo. This is the same shusse as we see in shussebora, and it means “promotion” (uo means “fish” and bora comes from hora which is short for horagai, or “giant triton“). Shusseuo are a strange concept: they are fish who are called by different names at different stages of their lives. As they age, they “promote” from one creature to the next. The only question that remains is why on earth would anyone come up with a sea snail that lives in the mountains and migrates to the sea to become a dragon? Well, part of that goes back to a play on the word hora. Hora is also a word for caves that are left behind after mudslides and avalanches. With earthquakes being quite common in Japan, and with the whole country being covered in mountains, it’s easy to imagine that new caves would be uncovered relatively frequently. The hora (shell)/hora (cave) pun would not be lost of clever yokai readers back in the day. The implication is that the caves were the nest spots of big horagai, and are left behind as the tritons migrate from mountain to sea. And thus, you have things like shellfish and tritons originating deep in the mountains!
. jinkai (陣貝), horagai (法螺貝 conch shell . Inari 稲荷　The Fox God Cult Kitsune, the animal fox.
. Ema 絵馬 votive tablets - Amulets . 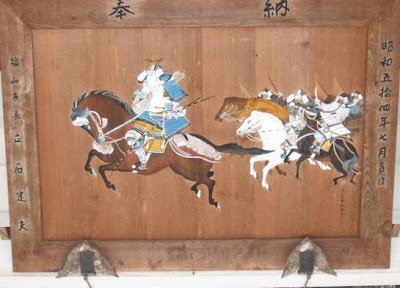 Ema, which means a picture of a horse in Japanese, was originally that, a wooden board with a painted picture of a horse. People wrote their wishes and prayers on the Ema and presented it to the shrine or the temple. Although in the beginning people presented actual horses when they made a wish, over the years people came to present pictures of horses instead. 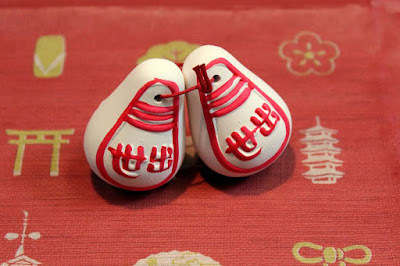 Today, Ema with other motifs are often used to make wishes as well. 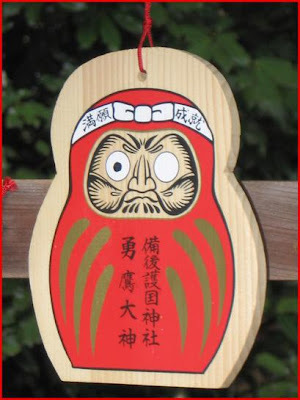 Although Daruma san is a Buddhist priest, his prayer boards are now also found in Shinto shrines. from Temple Nr. 23 of the 33 Kannon Temples in the Kanto area, Bandoo. 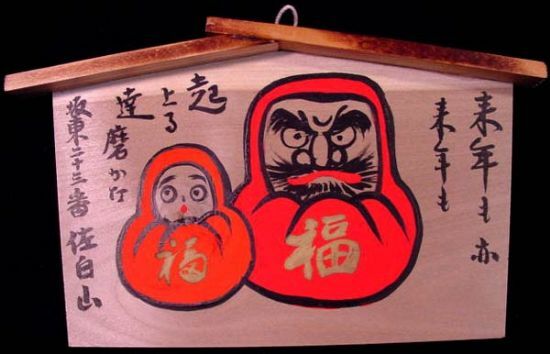 Daruma san and his wife have the Chinese character FUKU for good luck on their belly. 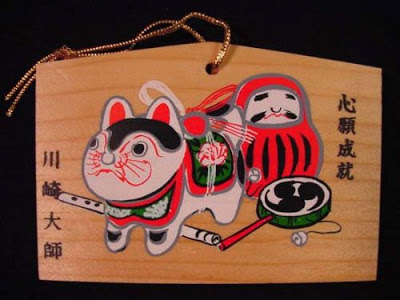 This Ema depicts Japanese folk toys that are considered to be good luck: Daruma and the Tokyo style Inu Hariko. Originally, dog figurines were used as a talisman in the prayer room in Heian period (794-1192) and that was said to be the origin of dog toys. In the Muromachi period (1333-1573), the custom of placing the paper mache dog toys in the room where women were having babies became increasingly popular. This custom was born because dogs were believed to have a very easy labor and their babies generally grow healthy and strong. Also they placed paper mache dog toys at the bedside of the baby as a talismanic charm. 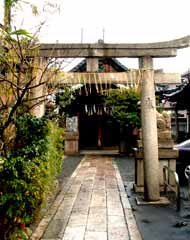 The name of the temple where this Ema board originated is Kawasaki Daishi temple located in the nearby city of Kawasaki. Kawasaki Daishi is a temple established about 870 years ago. Many visitors come here to pray and seek spiritual protection. During the New Year's holiday season, many Japanese people throughout the country visit shrines and temples to pray for safety and protection from evil and misfortune in the coming year. Kawasaki Daishi is among the top three most popular destination temples in the country for these traditional New Year's visits. 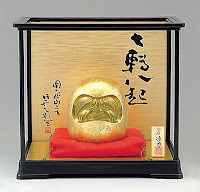 Also paper mache Daruma has been sold as a souvenir at the nearby gift shops of the temple since the end of Edo (1603-1867) period. 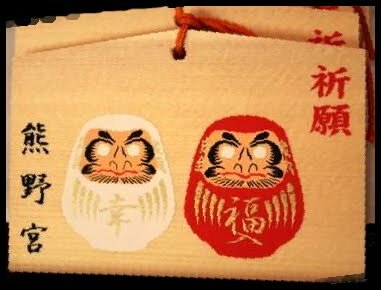 Having two lucky charms of Japanese folklore: Daruma and Inu Hariko, this Ema was probably made for the New Year's visitor to the temple in the year of the Dog sometime in the 1980's. This piece measures 3.5" high and 5" wide at the widest point. Here is a complete collection of EMA, just click on any of the numbers. Here is from 1 to 10, to read the wishes. Yushima Tenmangu is a Shinto shrine commonly called Yushima Tenjin. This shrine was originally established in 458 A.D. in order to worship Ameno-tajikaraono-mikoto, one of deities appears in the Japanese myths. Later, in February 1355, the spirit of Sugawara Michizane, a historical figure, was also enshrined to venerate his extraordinary virtue as a scholar. In October 1478, Oota Dokan(1432-86), a war lord in Kanto region, made the shrine building anew. Since then, many scholars and men of letters including Hayashi Doshun and Arai Hakuseki Confucian scholars in Edo period, have worshiped this shrine. 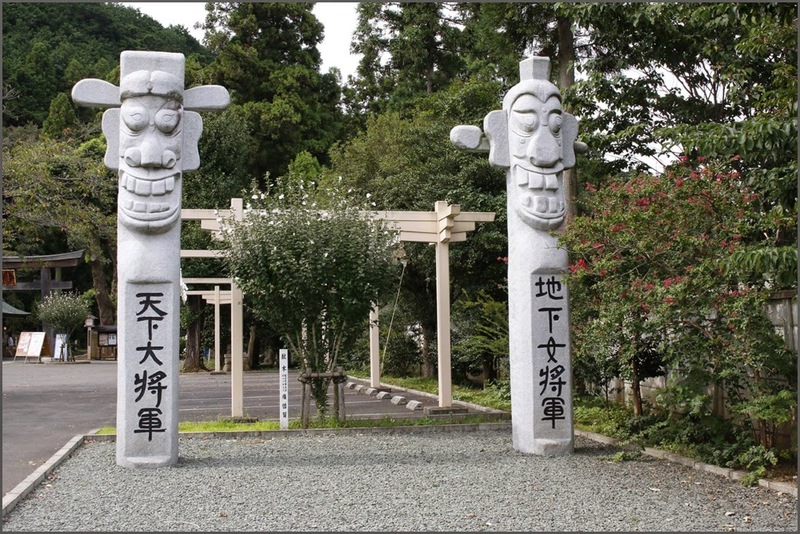 Nowadays many students visit this shrine to express their reverence to the enshrined spirit as Kami of Learning. Especially in the season of school entrance examinations, young students visit to pray for the success of passing examinations, presenting votive tablets called Ema. The shrine is also famous for beautiful blossoms of Ume (Japanese apricot) in the precinct. In February and March, "Ume Matsuri"(Ume festival) is held, and it attracts many visitors who enjoy the Ume blossoms. Festival at all Tenmangu shrines in memory of Sugawara Michizane, who is said to have died on the day of the rabbit, hour of the rabbit. Painted by handicapped people of the area. Each paints just a bit according to his abilities and more than 10 people work together to finish one. This is a rather special ema and brings a lot of good luck. 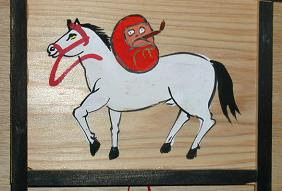 Daruma is enjoying himself, smoking a pipe on horseback.
. kagami ema 鏡絵馬 votive tablet as a mirror . "stickers for a thousant shrines"
Those papers are senjafuda, which literally means "thousand-shrine tags," and are posted by visitors to the shrine to mark their visit. The practice is said to date back 10 centuries to the Emperor Kazan (968-1008), who commemorated a pilgrimage to a temple by writing a poem and posting it on the temple gate. In those days, only the privileged classes were able to embark on religious pilgrimages, and they tried to visit as many famous religious spots as possible. That's the origin of the "thousand shrines" reference. Later, when travel opened up to other classes during the Edo Period (1603 to 1868), commoners embraced senjafuda and refashioned them into a chic pursuit. 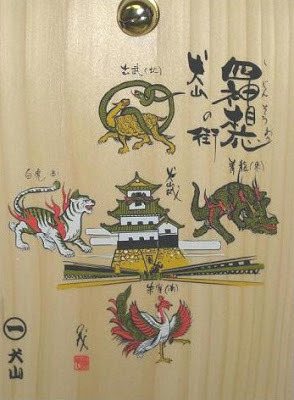 There are two distinct types of senjafuda: the black-and-white kind with names that you see on shrines and temples, which are called daimei nosatsu, and the far more colorful and elaborate kokan nosatsu, which were traded with other enthusiasts at events organized especially for that purpose. The only place to see these now is in museums or private collections. The best are true works of art, created by now-famous names in ukiyo-e prints, including Hiroshige, Eisen and Kuniyoshi. 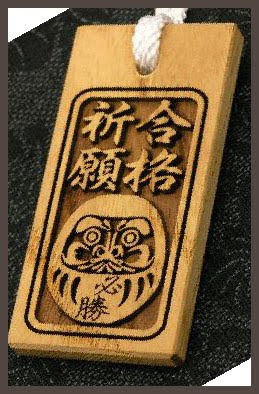 The basic rules are that you should never put a senjafuda on an important cultural property or on the framed devotional plaques hanging in some temples and shrines. Another no-no is covering someone else's senjafuda with your own. Beyond that, there are different schools of thought on what constitutes a good location. Some enthusiasts want a spot where their senjafuda will be noticed, while others prefer out-of-the-way places that are sheltered from sunlight and weather. But both schools seem to agree on one point: The higher the better. Reaching those heights requires a special tool. Yusuke brought out his father's handcrafted bamboo sao (pole), which looks like a sturdy walking stick. But it opens to reveal additional sections that can be telescoped out to nearly five meters in length. "The sao allows you to reach spots about seven meters overhead, factoring in your own height," he explained. "You start by sweeping away dust with a brush fitted onto the end, to prepare the surface. Then you pull the rod down, apply a special glue to the back of your senjafuda, and fix it into a double-hinged clamp on the back of the brush," Yusuke explained. "It requires a lot of experience to maneuver the wet senjafuda onto the wood, release the clamp, and smooth the paper out with the brush."
. My EMA collection - Regional Folk Toys .
. Ema for 2012, year of the Dragon . Here is the BIG one ! For the souls of those who lost their lives in the war.